HTML5 is a language for structuring and presenting content for the World Wide Web, a core technology of the Internet. 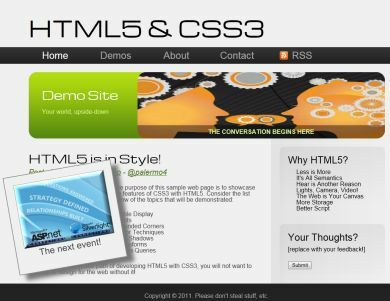 It is the fifth revision of the HTML standard (originally created in 1990 and most recently standardized as HTML4 in 1997) and as of August 2011 is still under development. Its core aims have been to improve the language with support for the latest multimedia while keeping it easily readable by humans and consistently understood by computers and devices (web browsers, parsers, etc.). Professional networking platform LinkedIn is launching redesigned versions of its mobile applications for Apple's (NASDAQ:AAPL) iOS and Google's (NASDAQ:GOOG) Android, concurrently introducing a new HTML5-based web app optimized for all current mobile browsers.